I must confess the reason I pushed for the Grimm version of Cinderella was the bloody shoes. Cinderella’s slipper differentiates it from all other “rags to riches” stories. It’s importance is heightened in the Grimm version by the dreadful acts of the two step-sisters as they actually slice off parts of their body in order to cram their feet into those shoes. Shoes are fascinating symbols in themselves. They represent ownership. In ancient times the Irish sealed a real estate deal by taking off their shoes and handing them to the buyer. New land was claimed by setting ones shoes on the property. In Cinderella, the Prince was setting out to claim ownership of Cinderella, but he needed both shoes to do so. On the other hand Cinderella was claiming the palace as her own by leaving a shoe there. The missing slipper also underscores Cinderella’s ambiguity in the household. She is the rightful heir of her father’s estate, but cannot claim her birthright. Cinderella, like many stories starring a maiden, contains coded warnings, comments or instructions for young women. Whenever you find young women and blood together in a story it refers in some way to menstruation and/or the breaking of the hymen. Blood is one of humanity’s most potent and complicated symbols because it stands for both death and life. It is a sacred fluid full of spiritual and magical abilities; Odysseus uses it to speak to the dead, Abel’s blood cries out from the ground to the Lord. In our story the birds speak for the blood. Oaths sworn in blood are considered binding for all time. The step-sisters shed their blood to seal a falsehood. The consequences are bound to be dire and they are. 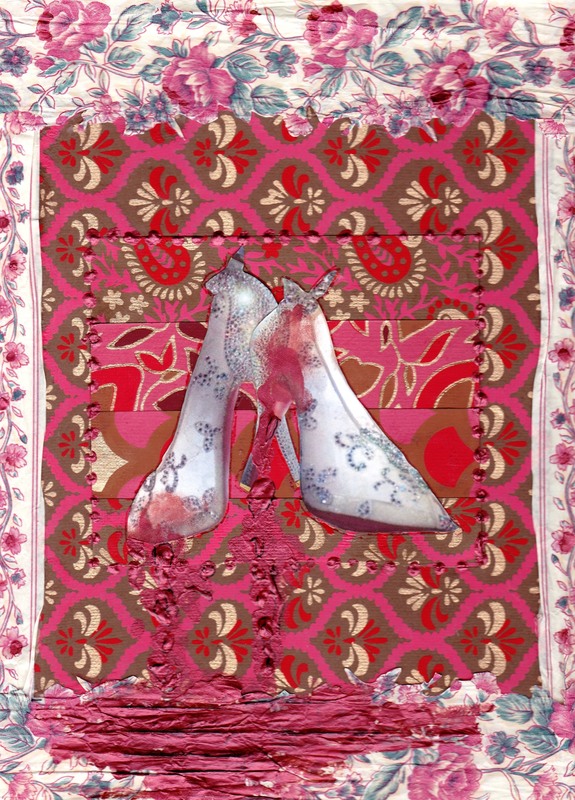 The bloody shoes may presage the tearing of Cinderella’s hymen once the Prince takes possession of her. Yet the tearing is a necessary precursor to both pleasure and reproduction. The blood in this story represents lifeblood, women’s blood. Perhaps, that’s why the step-sisters are blinded rather than killed in punishment for their cruelty and deception. Because of the blood, I wanted to make my collage red. The red on red on red motive symbolizes the layers of meaning inherent in red blood and in the color red itself. It is difficult to see into them, just as it’s difficult to untangle the various disparate yet connected strands of love, property, individualism, family, truth and lies that make up the tapestry of this story. The shoes are bleeding for all the literal and metaphoric reasons stated above. I set them in a border of flowers because this is a maiden story. It speaks of women’s mysteries and women’s doings and women’s solutions.